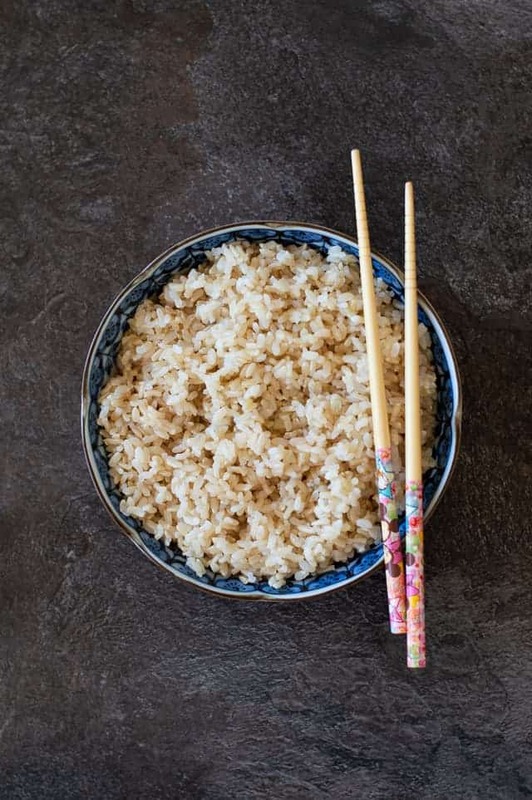 Everything you need to know about cooking wholesome brown rice in the Thermomix. I have to admit I’ve only just started cooking brown rice in the Thermomix as our induction cook top has broken and it’s taking ages to get it repaired. I love how easy it is to set and forget in the Thermomix and will use this method from now on. If you want to cook white rice or basmati rice – just reduce the cooking time. The recipe for Thermomix White Rice can be found here. 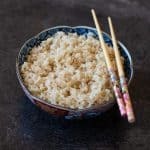 Easily cook brown rice in the Thermomix in under 40 minutes. Add the water to the TM Bowl, insert the simmering basket and weigh the rice in. Then take out the basket and rinse the rice under a cold tap for a few seconds then insert back into the TM Bowl. Cook for 35-40 mins/Varoma/speed 2. When finished, test that it’s cooked through and if not cook for a few minutes more. Drain and use immediately or let it cool completely before storing in an airtight container in the fridge for a few days.